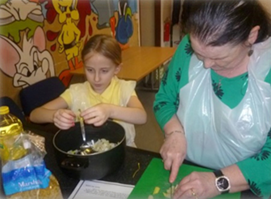 A programme of Healthy Eating Initiatives are run for all ages to enhance their knowledge of Healthy Eating and Cooking on a Budget. These programmes include cooking workshops to gain skills and knowledge on how to make low-cost healthy meals and snacks and an introduction to growing and harvesting vegetables in our community garden. Participation in cooking can help to increase confidence, raise self-esteem and develop social and team-working skills. Also, participants can learn new skills and cooking techniques, develop independent living skills and have a better understanding of healthy eating and provide inter-generational opportunities. Additional benefits can be a reduction in the health implications related to poor diet such as obesity, diabetes, heart disease, strokes and cancer. Programmes are available to children and young people, adults, parent and child classes and adults with additional needs.